Epilepsy is a life-threatening chronic disease in a state of neuronal over electric activity. The precise nature of the seizure recurrence has not been clearly. Synapses can be divided into silent and functional synapse.Silent synapses, defined as structural specializations for neurotransmission that do not produce a physiological response in the receiving cell, may occur frequently in neural circuits. Models of synaptic plasticity, such as long-term potentiation (LTP) and long-term depression (LTD) of glutamatergic synapses, are believed to underlie the seizure occurrence. Silent synapses containing only NMDA receptors are transformed within minutes into activated synapses postsynaptically AMPA receptor insertion and presynaptic transmitter releasing (BDNF-Cdc42 (brain derived neurotrophic factor-) signaling, Calcium influx,cAMP(Cyclic Adenosine monophosphate) signal pathway. All previous mentioned genes and proteins were abnormal in epilepsy patients and animal models. Future experimental and clinical studies are needed a better understanding on the mechanisms of silent synapses in epilepsy. Epilepsy is a chronic neurological disorder characterized by recurrent (two or more) unprovoked or spontaneous seizures due to abnormal hyperexcitable, hypersynchronous neuronal population activity. This disease is extremely dangerous and life threatening. However, the mechanisms of epilepsy and the neural consequences of epileptic neuronal activity were unclear [1,2] . These different ideas regarding seizure have been suggested as previous study including excitatory or inhibitory synaptic neurotransmission [1,2]. In the central nervous systems (CNS), synapses can be divided into silent and functional synapse.A silent synapse is an excitatory glutamatergic synapse whose postsynaptic membrane contains NMDA-type(N-methyl-D-aspartic acid) glutamate receptors but no AMPA(α-amino-3- hydroxyl-5-methyl-4-isoxazole propionate)-type glutamate receptors. Functional synapse would have all its normal structural components, and also possess an appropriate complement of the essential presynaptic molecules and postsynaptic receptors. Some synapses appear “silent” in young or old animal and people brain regions , such as hippocampus, cerebral cortex, the spinal cord. Silent synapses contain only NMDA receptors. It can been transformed into activated synapse containing both NMDA and AMPA receptors within minutes by simultaneous presynaptic and postsynaptic depolarization . Silent synapses, defined as structural specializations for neurotransmission that do not produce a physiological response in the receiving cell, may occur frequently in neural circuits. Silent synapses include incompletely assembled synapses that lack structural components, insufficient availability of key presynaptic proteins, and nonfunctional postsynaptic receptors, or presence of receptors that do not mediate a postsynaptic response except under specific conditions (conditionally silent synapses) [4,5]. The available silent synapses can often be rapidly activated, and conversely, active synapses appear to be rapidly silenced in many instances. Their recruitment to physiological effectiveness may be an important component of circuit modification. The conversion mechanism included:(1) postsynaptically AMPA receptor insertion  (2) presynaptic transmitter releasing:BDNFCdc42( brain derived neurotrophic factor-) signaling ;Calcium influx ;cAMP(Cyclic Adenosine monophosphate) signal pathway . All previous mentioned genes and proteins were abnormal in epilepsy patients and animal models. Activity-dependent modulation of synaptic function and structure is emerging as one of the key mechanisms in epilepsy treatment (Figure 1). A seizure is the result of an excessive discharge of hyperexcitable cerebrocortical neurons. Mechanisms of neuronal hyperexcitability were caused by ion channel citations, increased excitatory synaptic neurotransmission, decreased inhibitory neurotransmission. In the CNS the majority of excitatory synaptic transmission occurs at glutamatergic synapses and is mediated via the AMPA, NMDA, and kainate-type glutamate receptors [8-10]. Experimental studies using animal epilepsy models have shown that NMDA, AMPA and kainite agonists induce seizure activity, whereas their antagonists suppress seizure activity [11-15]. Models of synaptic plasticity, such as long-term potentiation (LTP) and long-term depression (LTD) of glutamatergic synapses, are believed to underlie the seizure occurrence in the adult brain and the activity-dependent regulation of synapse formation in developing brain . Glutamate receptors sensitive to AMPA are ligand- activated cation channels that mediate the fast component of excitatory postsynaptic currents in neurons of the central nervous system. There is emerging evidence that AMPA receptors may play a role in epileptogenesis and in seizure-induced brain damage . 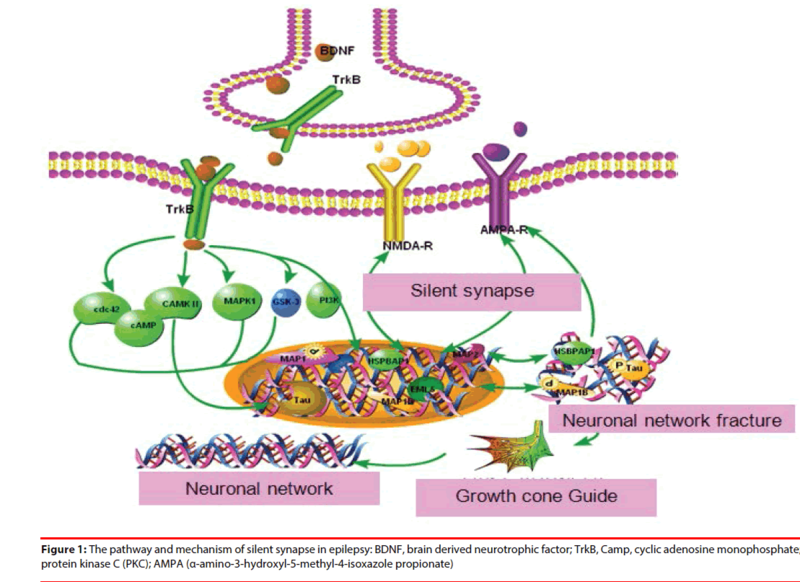 Efforts targeting AMPAR, such as perampanel , CPP , dizocilpine , D-2-amino-5-phosphonopen- tanoate (AP5)  have been focused on the identification of ligands as potential therapeutic agents useful in the prevention and treatment of a variety of neurological and non-neurological diseases [11,12]. The phencyclidine and ketamine were identiied as channel-blocking (uncompetitive) NMDA receptor antagonists in the epilepsy treatment . The molecular mechanisms underlying activation of presynaptic silent synapses and their contribution to long-term synaptic plasticity are widely unknown. The activation of presynaptic silent synapses is dependent on calcium [20-22], cAMP-dependent protein kinase [21,23], and BDNF-Cdc42 signaling [6,24]. Presynaptic LTP of synaptic transmission activates silent synapses and potentiates existing active synapses. Calcium is a major signaling molecule in neurons. Ca2+ influx through the L-type Ca2+ channels is much greater in the CA3 area of spontaneously epileptic rat than in that of normal animals . During the latency phase, Ca2+ role in epileptogenesis remains elevated and initiates many second messenger effects that produce long-lasting plasticity changes in these neurons [7,10]. Topiramate modulates hippocampus NMDA receptors via the increased neuronal Ca2+ in pentylentetrazolinduced epilepsy of rats . Ca2+ is known as the primary mediator of “excitotoxic” neuronal damage. Increase of concentration of Ca2+, activates many calcium-dependent enzymes, including CaMKIIα , protein kinase C (PKC) , nitric oxide synthase (NOS), and various proteases and endonucleases, gene and protein expression [22,23], neurotransmitters release from presynaptic sites, and neuronal excitable regulation. These enzymes may have direct effects on structural proteins, and may modify the functions of enzymes, receptors or ion channels by altering phosphorylation. In some neurons, Ca2+ influx contributes to spikerepolarization and after-hyperpolarizations [23,24]. Ca2+-induced genetic expression can be mediated by cAMP-response element binding protein (CREB), the activation of transcription factor CREB requires phosphorylation induced by CaMKIIα . All previous proteins and genes were abnormal in epilepsy patients and animal models. In vitro studies, perampanel potently inhibited AMPA-induced increases in intracellular [Ca2+] in cultured rat cortical neurons . cAMP is a classic second messenger. It can elicit a long-lasting increase in transmitter release at many central synapses by activating cAMPdependent protein kinase (PKA) [21,23]. PKA is believed to be a major modulator of synaptic transmission and underlie long-term potentiation of synaptic efficacy in epilepsy and enhance the release of transmitters and hormones [8,16,17]. Previous study also found that the activity of PKA was increased both in neocortex and hippocampus of epilepsy patients and animal models . A novel mechanism underlying activityinduced rapid presynaptic maturation of silent synapse was induced by activation of BDNFCDC42 signaling at presynaptic release sites . This rapid presynaptic maturation can be abolished by treatments BDNF inhibitor while BDNF can promote the synaptic rapidly maturation. The mechanism might be increased the presynaptic glutamate release and actin polymerization. Kindled seizures dramatically increased expression of BDNF and TrkB in the dentate gyrus , mossy fiber axons . In our previous study, we also found that CDC42 was higher in the brain tissue of epilepsy patients compared with the control tissue . BDNF is required for the induction of a presynaptic component of the functional conversion of silent synapses . Overexpressed BDNF associated with this LTP in epileptic patients and animal models [24,31], increases the excitation and decreases the inhibition in the brain and induces up-regulation of TrkB receptors, which in turn trigger many downstream signals. BDNF probably modulates GABAA receptors through mechanisms involving PKC phosphorylation. BDNF binding to TrkB results in receptor dimerization, enhanced activity of the CDC42 . CDC42 is the downstreampathway of BDNF-TrkB signaling in mediating activity- dependent presynaptic maturation and plasticity .The mechanism of Cdc42 induced rapid conversion of silent synapses might be actin cytoskeleton remodeling, and then induce the trafficking or scaffolding of vesicles or key exocytosis molecules to the presynaptic terminal . TrkB. Expression of BDNF mRNA and protein is obviously increased in a seizure of multiple animal models and the hippocampus of humans with temporal lobe epilepsy. Administration of BDNF and transgenic overexpression of BDNF enhance limbic epileptogenesis . Postsynaptically silent synapses and their conversion into functional ones via AMPA receptor trafficking mechanisms play an important role in constructing neuronal microcircuits . AMPARs inserted during the induction of LTP and removed during induction of LTD are depended on GluR1(glutamate receptor)-associated processes that stabilize AMPARs within the postsynaptic membrane, and GluR2-containing receptors processes that adjust AMPAR trafficking in the active and silent state, respectively, by the postsynaptic density scaffold proteins PICK and GRIP . Glutamate receptor channels mediate most excitatory transmission at synapses in the brain, and are critically important in synaptic transmission, plasticity, and protein–protein interactions in seizure occurrence . GluR1 and GluR2 are abundantly distributed in the neuronal layers of hippocampus hippocampus and changed in posttraumatic epilepsy , in the WAG/Rij rat model of absence epilepsy . Glutamate receptor antagonists protects against seizure-induced excitotoxic cell death in the brain . Previous mentioned proteins and genes are abnormal in epilepsy patients and animal model, therefore we speculated that epilepsy is associated with postsynaptic silent synapses activation. There is a substantial body of evidence from basic research that indicate an important role of silent synapse activation in epilepsy pathogenesis. The activation included postsynaptical and presynaptic silent synapses. Taken these results together, it is reasonable to purpose that silent synapse conversion may attenuate the frequency of seizures. Obviously, future experimental and clinical studies are needed to gain a better understanding of these and other possible mechanisms of silent synapse in epilepsy. This paper was supported by the grants of the Chongqing medical science and technology bureau of research projects (2009-2-356) and National Science Foundation (81100966). Mehta MR, Dasgupta C, Ullal GR. A neural network model for kindling of focal epilepsy: basic mechanism. Biological. cybernetics 68(4), 335-340 (1993). Kumar SS and Buckmaster PS. Hyperexcitability, interneurons, and loss of GABAergicsynapses in entorhinal cortex in a model of temporal lobe epilepsy. J.Neurosci 26(17), 4613 (2006). Castillo PE, Malenka RC, Nicoll RA. Kainate receptors mediate a slow postsynaptic current in hippocampal CA3 neurons. Nature 388(6638), 182-186 (1997). Liao D, Scannevin RH, Huganir R. Activation of silent synapses by rapid activity-dependent synaptic recruitment of AMPA receptors. J. Neurosci21(16), 6008 (2001). Kim JH, Udo H, Li HL, et al.Presynaptic activation of silent synapses and growth of new synapses contribute to intermediate and long-term facilitation in Aplysia. Neuron 40(1), 151-165 (2003). Shen W, Wu B, Zhang Z, et al.Activity-induced rapid synaptic maturation mediated by presynaptic cdc42 signaling. Neuron 50(3), 401-414 (2006). Amano H, Amano T, Matsubayashi H, et al.Enhanced calcium influx in hippocampal CA3 neurons of spontaneously epileptic rats. Epilepsia 42(3), 345-350 (2001). Porter BE, Cui XN, Brooks AR. Status epilepticus differentially alters AMPA and kainate receptor subunit expression in mature and immature dentate granule neurons. Eur. J.Neurosci 23(11), 2857-2863 (2006). Rakhade SN, Zhou C, Aujla PK, et al.Early alterations of AMPA receptors mediate synaptic potentiation induced by neonatal seizures. J.Neurosci 28(32), 7979 (2008). Yilmaz M, Naziroğlu M, Kutluhan S, et al.Topiramate modulates hippocampus NMDA receptors via brain Ca2+ homeostasis in pentylentetrazol-induced epilepsy of rats. J. Recept. Signal. Transduct. Res 31(2), 173-179 (2011). Rogawski MA and Donevan SD. AMPA receptors in epilepsy and as targets for antiepileptic drugs. Adv. Neurol 79(1), 947-963 (1999). De Sarro G, Gitto R, Russo E, et al.AMPA receptor antagonists as potential anticonvulsant drugs. Curr. Top. Med. Chem 5(1), 31-42 (2005). Hanada T,Hashizume Y, Tokuhara N, et al.Perampanel: A novel, orally active, noncompetitive AMPA-receptor antagonist that reduces seizure activity in rodent models of epilepsy. Epilepsia 52(7), 1331-1340 (2011). Rogawski MA. Revisiting AMPA Receptors as an Antiepileptic Drug Target. Epilepsy.Curr11(2), 56-63 (2011). Ngomba RT, Santolini I, Salt TE, et al.Metabotropic glutamate receptors in the thalamocortical network: Strategic targets for the treatment of absence epilepsy.Epilepsia 52(7), 1211-1222 (2011). Katz LC and Shatz CJ. Synaptic activity and the construction of cortical circuits. Science 274(5290), 1133 (1996). Yen W, Williamson J, Bertram EH, et al.A comparison of three NMDA receptor antagonists in the treatment of prolonged status epilepticus. Epilepsy.Res 59(1), 43-50 (2004). Monaghan DT and Cotman CW. Identification and properties of N-methyl-D-aspartate receptors in rat brain synaptic plasma membranes. Proc. Natl. Acad.Sci83(19), 7532 (1986). Clifford DB, Olney JW, Benz AM, et al.Ketamine, phencyclidine, and MK-801 protect against kainic acid-induced seizure-related brain damage. Epilepsia 31(4), 382-390 (1990). Kristensen AS, Jenkins MA, Banke TG, et al. Mechanism of Ca2+/calmodulin-dependent kinase II regulation of AMPA receptor gating. Nat. Neurosci 14(6), 727-735 (2011). Yechikhov S, Morenkov E, Chulanova T, et al. Involvement of cAMP-and Ca2+/calmodulin-dependent neuronal protein phosphorylation in mechanisms underlying genetic predisposition to audiogenic seizures in rats. Epilepsy. Res 46(1), 15-25 (2001). Zhang X, Daugherty SL, de Groat WC. Activation of CaMKII and ERK1/2 contributes to the time-dependent potentiation of Ca2+ response elicited by repeated application of capsaicin in rat DRG neurons. Am. J. Physiol. Regul. Integr. Comp. Physiol300(3), R644 (2011). Cousin MA and EvansGJO. Activation of silent and weak synapses by cAMP-dependent protein kinase in cultured cerebellar granule neurons. J.Physiol 589(8), 1943 (2011). Cabezas C and Bu WO. BDNF is required for the induction of a presynaptic component of the functional conversion of silent synapses. Hippocampus 21(4), 374-385 (2011). Groth RD, Lindskog M, Thiagarajan TC, et al. Beta Ca2+/CaM-dependent kinase type II triggers upregulation of GluA1 to coordinate adaptation to synaptic inactivity in hippocampal neurons. Proc. Natl. Acad. Sci. USA108(2), 828 (2011). Bowling N, Walsh RA, Song G, et al.Increased protein kinase C activity and expression of Ca2+-sensitive isoforms in the failing human heart. Circulation 99(3), 384-391 (1999). Yasuda H, Huang Y, Tsumoto T. Regulation of excitability and plasticity by endocannabinoids and PKA in developing hippocampus. Proc.Natl. Acad. Sci105(8), 3106 (2008). Sato Y, Roman M, Tighe H, et al.Immunostimulatory DNA sequences necessary for effective intradermal gene immunization. Science 273(5273), 352 (1996). Nibuya MS, Morinobu, Duman RS. Regulation of BDNF and trkB mRNA in rat brain by chronic electroconvulsive seizure and antidepressant drug treatments. J.Neurosci15(11), 7539 (1995). Xiao F, He M, Wang XF, et al. Overexpression of the Cdc42 in the brain tissue of human with intractable temporal epilepsy. Zhonghua. Yi. Xue. Za. Zhi87(29), 2030-2032 (2008). Heinrich C, Lähteinen S, Suzuki F, et al.Increase in BDNF-mediated TrkB signaling promotes epileptogenesis in a mouse model of mesial temporal lobe epilepsy. Neurobiol. Dis 42(1), 35-47 (2011). Li H, McDonald W, Parada I, et al. Targets for preventing epilepsy following cortical injury. Neurosci.Lett497(3), 172-176 (2011). Sametsky EA, Disterhoft JF, Geinisman Y, et al.Synaptic strength and postsynaptically silent synapses through advanced aging in rat hippocampal CA1 pyramidal neurons. Neurobiol. Aging 31(5), 813-825 (2010). Emond MR, Montgomery JM, Huggins ML, et al. AMPA receptor subunits define properties of state-dependent synaptic plasticity. J.Physiol588(11), 1929-1946 (2010). Dingledine R. Glutamatergic mechanisms related to epilepsy: Ionotropic receptors. Epilepsia51: 15-15 (2010). Kharlamov EA, Lepsveridze E, Meparishvili M, et al.Alterations of GABAA and glutamate receptor subunits and heat shock protein in rat hippocampus following traumatic brain injury and in posttraumatic epilepsy. Epilepsy. Res95(1-2), 20-34 (2011). NgombaR, Santolini I, Biagioni F, et al.Protective role for type-1 metabotropic glutamate receptors against spike and wave discharges in the WAG/Rij rat model of absence epilepsy. Neuropharmacology60(7-8), 1281-91 (2011). Schauwecker PE. Neuroprotection by glutamate receptor antagonists against seizure-induced excitotoxic cell death in the aging brain. Exp. Neuro 224(1), 207-218 (2010).